Review articles — papers that summarize a topic or a technique, assessing our present state of understanding and our hopes for the future — are useful and often enjoyable to read. In Physics, these are well respected but rather rare. In Biology, it sometimes seems like the ratio of primary articles to review articles isn’t much greater than one. In some sub-fields, like microbiome research, I’m pretty sure it’s less than one! 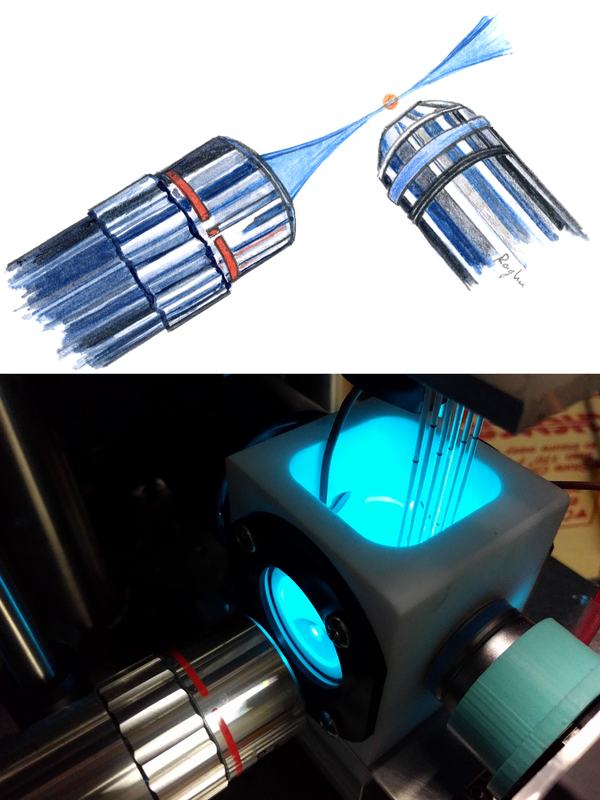 a summary of the (few) examples to date of light sheet fluorescence microscopy of microbial communities, with an admittedly large focus on my own lab’s work. a few pointers to the many microbial systems waiting to be explored with this approach. From Siedentopf H, Zsigmondy R: Über Sichtbarmachung und Groessenbestimmung ultramikroskopischer Teilchen, mit beson- derer Anwendung auf Goldrubinglaesern. Annalen der Physik 10:1–39 (1903). In the ultramicroscope, one looks at scattered light, not fluorescence. The modern renaissance in light sheet methods uses the sheet for fluorescence excitation, and is due in large part to work in the first decade of the 2000s by Ernst Stelzer and colleagues at the EMBL in Heidelberg. What I hadn’t seen, until I dug them up while working on this review, were some century-old comments on the ultramicroscope. One was a 1909 book review from Science on a text by Zsigmondy, “Colloids and the Ultramicroscope” [Louis Kahlenberg, Science 30:184 (1909)]. The author notes that the ultramicroscope “opened up a new method of attack of some of the perplexing problems of solutions,” and also that “To most chemists and physicists the work of Siedentopf and Zsigmondy is perhaps already familiar.” This highlights that light sheet imaging was not at all obscure — Zsigmondy won the Nobel Prize in Chemistry in 1925 for work on colloids — making it all the more surprising that the light sheet geometry for microscope was largely forgotten for much of the rest of the century. The reviewer is a bit critical of the high price of the book — $3, which is about $75 after adjusting for inflation; one imagines the reviewer would be in shock at seeing modern technical book prices. Another nice old paper was an article in Scientific American from 1915 on “The Ultramicroscope and its Application to Modern Biology” [Scientific American, 80, Supp. 2074:211 (1915)]. I got this through interlibrary loan, but it’s available via Google as well, here. This essay is particularly relevant to my article, as it focuses on the uses of the ultramicroscope for looking at the living world. This includes the interiors of eukaryotic cells, whose “plasma seems to be filled with moving corpuscles which look like stars in the sky at night,” and even viruses, though they weren’t denoted as such: “… the exciting cause of the foot and mouth disease is of ultramicroscopic nature.” Without clearly stating it, what the essay is getting at is that the scattering of the illumination light provides a way of detecting particles that are too small (“ultramicroscopic”) to be resolved by optical imaging, a general physical principle that is relevant to lots of analysis techniques. Feel free to read and comment on the preprint I’ve linked to above, and keep in mind the lesson from a hundred years ago: light sheet imaging is a powerful technique for exploring the microscopic, living world.